Home #ValenciaGP 2015 fp2 GRAN PREMIO MOTUL DE LA COMUNITAT VALENCIANA motogp Movistar Yamaha MotoGP #TheGrandFinale Valentino Rossi A change of focus for Rossi? Throughout his career, and especially in recent years with the change to the 15 minute shootout sessions, Valentino Rossi has had great difficult in qualifying. The Movistar Yamaha rider has often had to spend extra time to find a qualifying setting, with the three point penalty from Sepang Rossi no longer has to worry about Qualifying. Many suspected that with the ‘burden’ of Qualifying removed Rossi would be able to focus all of his efforts on a setting for the race, able to charge through the field with ease. One sign of working on race setting during practice session is many laps in succession. During FP1, Rossi did a total of 21 laps, his first run consisting of 15 laps without a break. Marc Marquez’s (Repsol Honda) first run during FP1 consisted of 13 laps. Rossi’s unbroken 15 lap run was the longest of any MotoGP™ rider in the first session, and the second longest of the day overall. 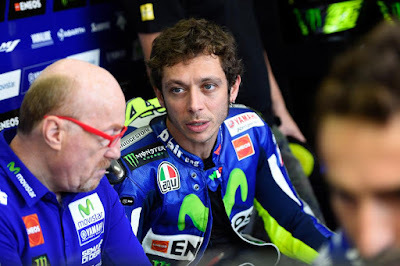 In Phillip Island for FP1 Rossi completed 16 laps, in Motegi 19. But both of those circuits are much longer than the 4 kilometre Ricardo Tormo Circuit. In Misano, a circuit that is 4.2 kilometres long, Rossi also set 21 laps in FP1 but did so over three runs of seven laps each. Despite what he says, it seems that Rossi’s approach has changed from the norm, as he no longer has to worry about a grid position and is putting in longer runs. During FP2 Rossi opted for a series of shorter runs, focusing more on changing the setup of his Movistar Yamaha M1. In both sessions Rossi was able to lap in the mid to low 1’32s with ease, matching the likes of Jorge Lorenzo and Marc Marquez at the top of the time sheets. Ending the day in fifth provisionally sees Rossi advance directly into Q2, The Doctor could use this 15 minute shootout session as yet more time devote to race pace: “Now we have to decide the strategy. It’s tough to use the 15 minutes of Qualifying like Free Practice because there are still other riders on track and maybe going slower as they are waiting for a tow. I think it’s going to be hard and I’ll try to make the normal procedure,” he said after FP2. While there hasn’t been an overly dramatic shift in how he goes about a weekend, it is clear that Rossi is making the best of his situation. Most of the Open riders were only able to produce low 1’32s as their fastest single flying lap. There’s little doubt that based just on race pace Rossi should be able to pass a number of riders in the opening laps. With a strong race pace and a seven point championship lead, the 2015 title is far from over for The Doctor. Rossi responded: “No, seriously no. Very similar to usual. I have to say when I ride I am more relaxed than usual! I’m quite happy about the first practices. This morning my pace wasn’t so bad and I was competitive on used tyres. We tried something different in the afternoon that improved my lap times."